The critical issue in Presidential politics at the end of the 20th century was captured in the mantra, “It’s the economy, stupid.” Although economic performance alone is not sufficient, it is necessary. By the end of the 20th century, persistent federal government budget deficits had been replaced by surpluses. Today is so very different. The economy is far from robust. Government is much worse. The magnitude of the problems is reflected by the country spending $3 trillion while collecting only $2 trillion in tax revenues, resulting in a $1 trillion deficit. No enterprise—public, educational, charitable, private, household—can pursue perpetuity pattern of spending more than it generates. If negatives persist, balance cannot be sustained. The lesson of history is clear: An enterprise must balance its books by connecting spending to revenues generated or otherwise obtain resources either through theft from direct stakeholders or third parties. The former tactic motivates government policies that transfer monies from the private to public sector, or military conquest, through taking wealth from people of other places. Given that solving internal economic challenges or improving citizens’ standard of living through military conquest is less viable in the 21st century than it may have been in prior times, the role of economic power is of ever greater import in the global community. Civilization sustainability viewed through the prism of government finance is the subject explored by Glenn Hubbard and Tim Kane in Balance. 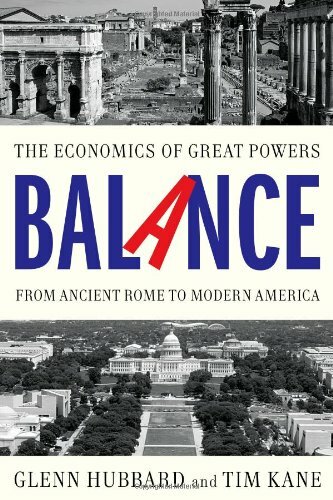 The scope of their study, captured in the subtitle The Economics of the Great Powers from Ancient Rome to Modern America is visually illustrated by cover images of ancient Roman ruins contrasted to the Capital building in Washington, D.C. The authors proclaim, “This book is not about empire but about economic data and the hard facts of Great Powers in human history.” They advance the idea that their contribution, “comes from our peculiar domain of economics . . . supply and demand and incentives and constraints and markets are not just for goods and services, but also markets for prestige, security, and political power.” The focus of Balance on economic data is especially timely, with recognition of the important role of big data. This statement reflects innocence that extraordinary scientific accomplishments, original innovations, and technology advances are traceable as much if not more to Asia than to the West. Further, implying that leading economies are somehow mired in “the thick forest of scientific ignorance,” while discounting how leveraging existing technology can lead to great advances is at least curious, if not overtly inaccurate. Mr. Hubbard and Mr. Kane deftly deploy data to drive home some very important points. One of the most telling is their tracking the shifting composition of federal expenditures, as a function of overall economic activity, over time. Whereas six decades ago, the nation’s defense spending was four times entitlements spending, today three times more is spent on entitlements than on defense. The authors singularly and effectively employ macro measurement of aggregates over time to comprehend larger forces, to isolate critical issues, and to advance analyses that reveal insights that escape those whose tools are limited to textural description. Dealing with big ideas and important concepts, Balance is engagingly and accessibly told, for anyone with basic third grade arithmetic can follow the important numbers. Balance merits the widest audience.